our old website just wasn’t cutting it for us, so we are in the midst of putting up a new one. we have kept our email and social media links, so click away if you feel inclined. we have an Etsy shop where we sell the stuff that we make. here’s the link. it’s difficult to credit, but blindpigpress has been around since 1991. by our calculations, we have been doing what we do for at least three years. we are a private press in grimsby, ontario, canada and print all sorts (p.i. *) of stuff. we use handset metal and wood types to print this stuff and we do it, primarily, on a 10″ x 15″ Chandler & Price platen press — it has a treadle! we like to use the ‘royal we’ because we don’t like to draw attention to who we really are. we feel that at this point in our lives, we are simply blindpigpress. our personality has merged with the machines, type and ideas that we use. we mostly do this for the love of type. we got hooked when we were younger and studied graphic design at the nova scotia college of art and design (we have a diploma but we can’t find it). the first type we ever set by hand was a 72-point version of Hermann Zapf’s Michaelangelo. we also worked at the Dawson Room at Dalhousie University with Professor Robert Dawson. when we moved back to ontario, Bill Poole of Poole Hall Press invited us to come and print at his shop in grimsby. little did he know that he would be stuck with us. if forced to talk about why we chose to print letterpress, the explanation would be a bit sketchy (p.i.*). like most things that are really close to our heart, we try not to talk about it too much. we like to suppress our feelings! this empowers us! however, we are forcing ourselves to share, so here it goes. we like to do things. we like to create and make objects that we think aspire (on a good day) to beauty. we like to understand the things we do. we like to control the means of production (we also like to own the means of production). we like seeing the type press into the paper (we really like that!) we like the transfer of the ink to the page. we like to be able to troubleshoot on the fly. 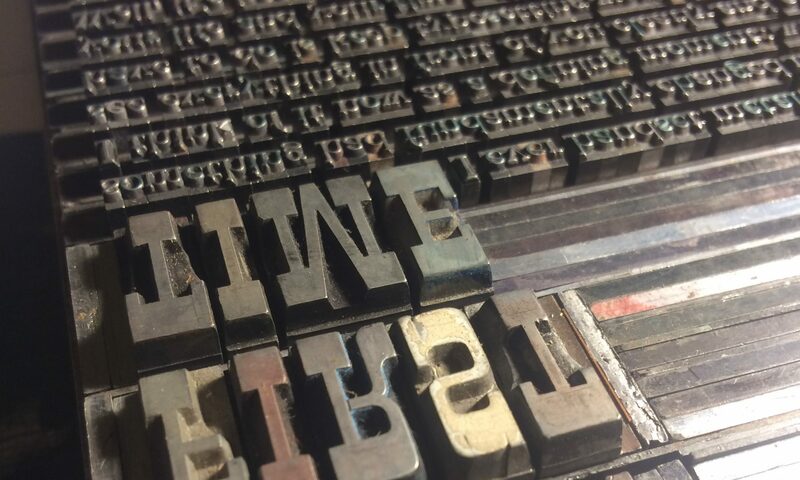 letterpress is a simple process that can get really complicated if you let it. we try not to let it. we are friendly people! well, not really, but still feel free to get in touch with us via the interwebs. you can fill in the form below or click the link at the bottom of the page or not. the illusion of choice is yours!